As the demand for manufacturing automation is growing, it is China that primarily drives demand. With just under 15% of global GDP credited towards China, the Asian nation accounts for more than double that amount of demand for automation technology. Nearly 1/3 of all manufacturing automation demand is expected to come from China, which is expected to have a 21% compounded annual robotic growth rate, an HSBC report points out. In North America, the growth rate is expected to trail at 7%. In the US, the primary concern is how automation is going to take away jobs. In 2013, a widely noted report by Oxford professors Carl Frey and Michael Osborne predicted that 47% of the US workforce, or nearly 69 million jobs, would be automated out of existence. More recent estimates from the McKinsey Global Institute have put the automation job loss numbers at 75 million US jobs with worse case forecasts claiming as much as 65% of all jobs could be lost to automation. Businesses will be on the front lines of the workplace as it changes. This will require them to both retool their business processes and reevaluate their talent strategies and workforce needs, carefully considering which individuals are needed, which can be redeployed to other jobs, and where new talent may be required. Many companies are finding it is in their self-interest—as well as part of their societal responsibility—to train and prepare workers for a new world of work. Where is this automation philosophy being most commonly accepted? Not in the US or Europe, but rather China is leading the world. Around the globe, there is an average of 69 robots per 10,000 workers. By 2020 there are projected to be 150 robots per 10,000 workers, nearly tripling the current standard and displaying almost a 3x growth rate. Nearly 1/3 of all robotic demand is coming from China. As the Chinese workforce begins to age and expects higher wages, they are no longer the low-cost producer in the region. With the assistance of government policy, an embrace of automation is driving interest in corporations such as Apple to set up shop in the area. 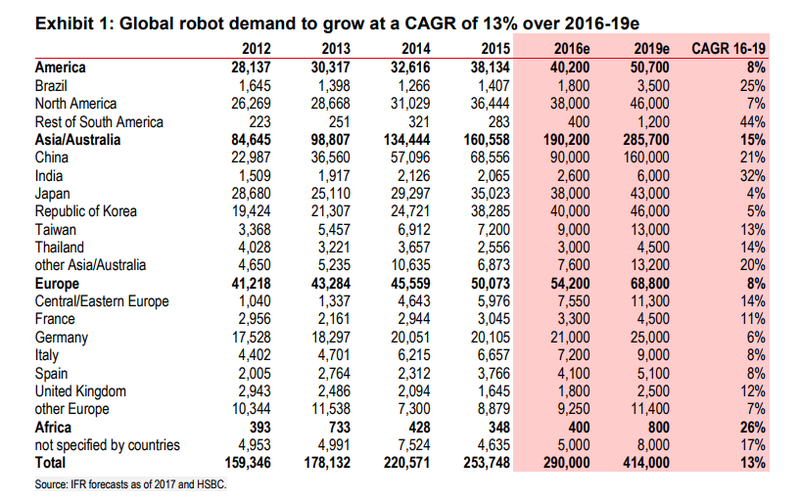 HSBC points to Chinese automotive concerns being the primary buyers of industrial robots, but the automation trend is spreading to electronics, semiconductors, smart factories, logistics, household appliances and electric vehicles. With breakeven rates expected to reach less than one year in 2019, manufacturing automation is a trend that could see quicker adoption. Where do most of these robots come from? Largely Japan, at present. From 2015 to 2016, 70% of imported industrial robots came from Japan, with only 8% coming from domestic Chinese producers. 35% came from other global suppliers. In this regard, HSBC likes Japanese automation provider FANUC as one of their top investment picks.